One of my LED Bulbs showed some unusual behaviour during the Peak hours. Unusual dimming, flickering, lighting faintly after switch off etc. It is a 15 watts LED bulb purchased for Rs.300. Checked its specifications. It is 980 Lm and 6500 K . That showed that there is something related to Watts, Lm and the K. The manufactures say that, instead of Watts, look the Lm before purchasing the LED bulb because “Watts” is an obsolete term for the LED bulb. Then what are the Lm and K? Lm is the short form of “Lumen” which is the measure of total amount of light from a source. As a general rule, a 100 watts ordinary bulb gives 1500 lumen light. 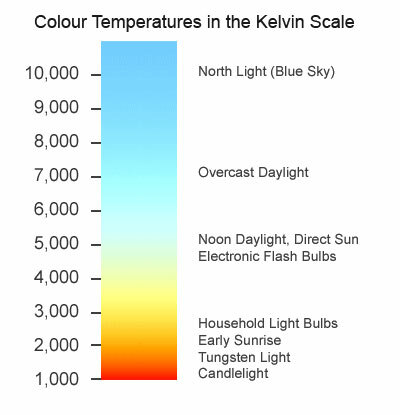 K is the short form of “Kelvin” which is the measure of “Colour Temperature “of light. For example, the day light has 5000 K and a White LED Bulb gives around 6000 K . As the Colour temperature value increases, the light turns more and more white then turns to blue. Lower values of K shows Yellow to Red light. So as per the specification, the LED bulb should give 980 Lumens and 6500 K light. Ideal its specifications. Then what is happening in it. Analysed thoroughly. Connected the 15 W LED bulb in the Power Meter. It shows that the LED Bulb is 3.5 watts! What is happening? Verified the Current consumption of the 15Watts LED bulb. Wonder! It is using only 89 mA current. In first thought we feel that the bulb is very good because it is consuming very little current but Power is the Capacity of an Electrical device. P = V x I, where P is the power in watts, V is the voltage and I is the current in Amps. V = P / I = 3.5 W/ 0.089 Amps = 39.32 volts. Then P= 39.32V x 0.089 Amps = 3.49 W. That is 3.5W. Then what about the voltage for the LEDs. It has 20 LEDs. 39.32 / 20 = 1.96 volts. 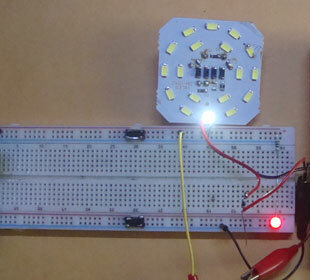 The Forward voltage of each LED is 1.96 volts. We can round it as 2 volts. But its current consumption to be checked to find out the watts of each LED. Opened the LED Bulb. It has a PCB inside and nothing more. The front side of the PCB has 20 LED chips, 4 diodes and three 474 resistors. 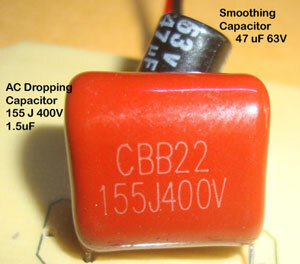 On the back side of PCB, there is a 155 J 400V AC dropping capacitor and a 47uF 63 volt Smoothing capacitor. The 63 volt Smoothing capacitor shows that, the voltage in the PCB is maximum 63 volts. So the 155J (1.5 uF) capacitor along with the diodes converting 220V AC to 63V DC maximum. More analysis needed to check the Power of LEDs. Disconnected one LED from the PCB connections and soldered two wires to give current from external source. Provided 12 volt DC from the power supply. 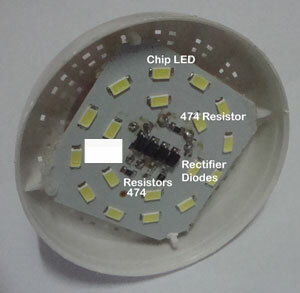 Since 474 resistor is used in the PCB, a 470 resistor was used in series with the LED. LED showed good brightness. If = 12V – 2V / 470 = 0.021 Amps or 21 mA. This is the condition of LED. It is 2 volts and using 21 mA current to give good brightness. Then its Power. P = V x I = 12 x 0.021 = 0.25 watts. Each LED used is 0.25 watts. So how much watts for the complete 20 LED set. P= V x I = 40 V x 0.42A = 16.8W. The Specification is 15 W. No problem, slight difference. 1.5 /1.3 x 0.06 = 0.069 Amps or 69 mA. We can round it as 70 mA. So the 1.5 uF capacitor can give maximum 70 mA current. Then how it provide the required current of 420 mA to the 20 LED array? P = V x I = 40 V x 0.07A = 2.8 W.
Watts – 0.7 watts difference. It is the current used by the circuit except LEDs. 2.8W + 0.7 W = 3.5W). Exactly similar to the Power Meter reading. Meter is not lying. The 15 watts LED bulb is actually 3.5 watts. 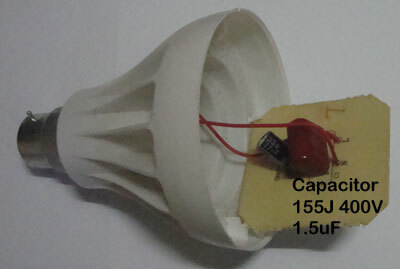 It shows that the 15W LED bulb should give 900 Lumens. In the bulb it is shown as 940 lumens. But in real situation, the 3.5 Watt LED bulb gives around 210 Lumen only. So I purchased one 15 watts 980 Lumen LED bulb which is 3.5 Watts 210 Lumens in the real situation. That is why it is dimming, flickering etc because the current is not sufficient to drive the load in Peak hours when the line voltage drops. Actual current needed is 420 mA but it is giving only 89 mA. Definitely, it reduces current consumption because only 89 mA is using but giving only 210 lumens light similar to a 15 watts ordinary bulb. But we feel more brightness because the Colour temperature of the White LED is around 7000 K.
So the LED bulb should have an LED driver ( Not a Capacitor Power supply ) to give sufficient Voltage and Current. Then only it can give the required Power, Lumens and K.